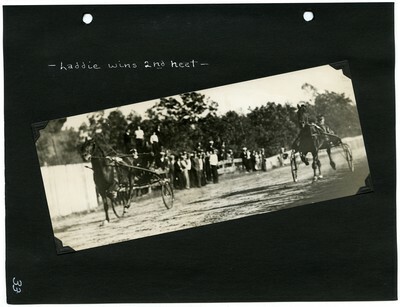 Sepia tone finish line action photo of the second heat of the 2.27 Trot at the Shapleigh and Acton Fair, Union Park, Acton, Maine, Wednesday, October 3, 1934. The bay colt, Laddy, Cameron up, finished the heat in first place with bay mare, Sally Audubon (image right), dropped back to second. Ultimately, Sally Audubon won the $200 purse.